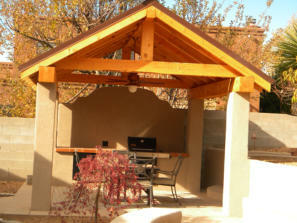 Shade structures are great additions to patios, but are also great for other gathering spaces. They are also useful to create separate private spaces away from a main patio that offer seclusion or the feeling of being in a completely different location. 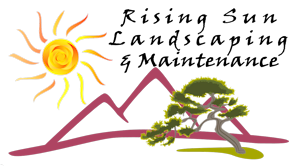 Contact Rising Sun Landscaping & Maintenance, as your contractor, will go over all the options and discuss which fit best into your landscaping project. Shade structures is a general term for any type of cover, or shelter, that provides some refuge from direct sun, rain, and sometimes wind. It might include awnings, roof, pergolas, and gazebos, pavilions, and summerhouses. In considering these as options in your landscaping, decide if you want permanent structures or if you’d rather invest in movable umbrella shade. These kind of structures may have less to do with shade than producing a separate private space in your landscaping for solitude or interacting with others. There are many options. Look around for those that would work well in your landscaping. Also consider the cost of custom construction versus pre-built units. Pre-built units that are assembled in your landscaping project are becoming very popular and can be found in home supply and wholesale stores. Custom units can be more easily tailored to your existing buildings, landscape style, and space on your property. 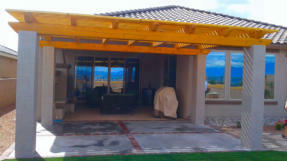 Pergolas are not solid structures that protect from rain or all direct sunlight. They are a latticework or arbor formed of horizontal trelliswork supported on columns or posts. Usually they are assembled to create a separate airy space over which lighting can be hung or vines or other plants can be grown. There may or may not be fencing or other boundary between the pergola and nearby space. Rising sun will create custom-built pergolas or install prefabricated pergolas. Gazebos are more traditional structures that are constructed with posts, beams, and latticework, usually with a solid roof that provides shelter from rain or sun. 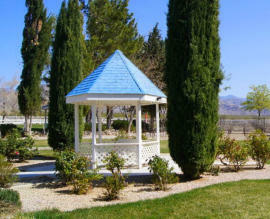 Gazebos traditionally have fencing or railing around the outer perimeter except for one or two entryways. Many times built-in seating is provided. Some may be screened with doors to keep out insects. Other terms for gazebo are pavilion and summerhouse. They are usually built in a location that provides an relaxing or attractive view from within and also a place where their ornate structure adds aesthetics to the landscape. Rising sun will install prefabricated Gazebos, but we do not build custom Gazebos. Employee break areas and smoking areas can benefit from shade structures that protect from the sun, rain, and wind. Providing a more enjoyable space for breaks will lead to more productive employees refreshed to provide better customer service.